A proposal to prohibit off-campus practices during a vacation period – like Michigan football’s trip to IMG Academy over spring break last season – was passed Friday by the NCAA’s Power Five conferences at the annual convention. There was majority support from all five leagues for the proposal, which voted 58-22 for the ban. That included an 11-3 vote by Big Ten teams, according to ESPN.com. Interestingly, student-athletes on the 80-member autonomy board voted 11-4 against the proposal. Michigan coach Jim Harbaugh took his team to IMG Academy in Bradenton, Fla., during the university’s spring break last year. 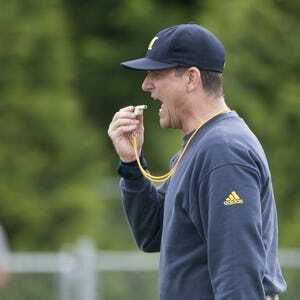 Michigan practiced four times and the last was open to the public and recruits. Florida high school coaches could attend any of the practices. Southeastern Conference commissioner Greg Sankey was vehemently opposed to the trip because of time concerns for student-athletes, which has become a top topic at the NCAA. But the trip was perceived as a recruiting advantage. Schools can hold on-campus practices during spring break. This new rule will not affect overseas summer trips that so many basketball teams, including Michigan, have done. “What Jim was able to do by having them practicing over spring break and taking them off campus was to give them more time at the end of the semester to study for exams,” Manuel said, pointing out that spring practice last year concluded before final exams. A report Thursday on ESPN.com indicated the NCAA Division I Student-Athlete Advisory Committee (SAAC), was on board with eliminating the spring practice trip over spring break Michigan's football team took last year. The Pac-12 originally proposed last November a change in rules to prevent a trip like the one Michigan took. The SAAC weighed in on the subject after the Division I Council asked the group to review the situation and make a recommendation at this week's annual convention. "We all agree, that's something that should not happen," SAAC co-chair Bradley Bramlett told ESPN.com. "We're very adamant that, in your non-championship season, if you have a vacation period, it should really be a vacation period. If we're going to honor student-athletes' time, we need to honor to the utmost." The SEC and ACC commissioners were vehemently opposed to Harbaugh’s spring-trip idea from the get-go last year. John Swofford, the ACC commissioner, during an interview on Sirius XM College Sports, echoed Sankey’s comments that Harbaugh’s plan was being negligent to student-athletes. Sankey responded to the tweet in an AL.com story. Swofford did concede Harbaugh had been creative in his approach. “It’s an issue we need to address,” he said. “It’s certainly out-of-the-box thinking and creative thinking, but on the other hand, to me, and this is just one man’s opinion, it seems a bit in contrast to the overall thinking that we’re all trying to put into time demands for student-athletes and giving our athletes more time to have to themselves to be more a part of a college experience and be more a part of college life.